Samsung has two memory advances to talk about one flash and one DDR, one real the other not quite real. The scant few details released sound cool but getting anything useful out of the company is fruitless so enjoy what little is available. Samsung has announced a 3GB LP-DDR3 package which is the next obvious step for the smart phone market. If you are thinking Samsung is taking three 1GB/8Gb chips and stacking them, that would be the logical conclusion. Fortunately that rather boring scenario is not the case, Samsung has made custom 6Gb LP-DDR3 devices and is stacking four of those to get 3GB. This allows for two channels of 1.5GB so a mobile device can have wider memory. These devices are built on what Samsung calls a 20nm-class process, which is a disingenuous term for something between a 20nm and 30nm process, possibly inclusive, possibly not. Last time we talked to Samsung about it they would not admit to it being inclusive or exclusive, nor admit to the actual process node even though SemiAccurate had been handed a wafer by Samsung at the last Common Platform event. For some reason we didn’t bother to ask for “more” details this time around. The package looks to be a standard PoP memory pinout but who knows? The other announcement was a little bit more interesting. Samsung has a 2.5″ NVMe SSD. 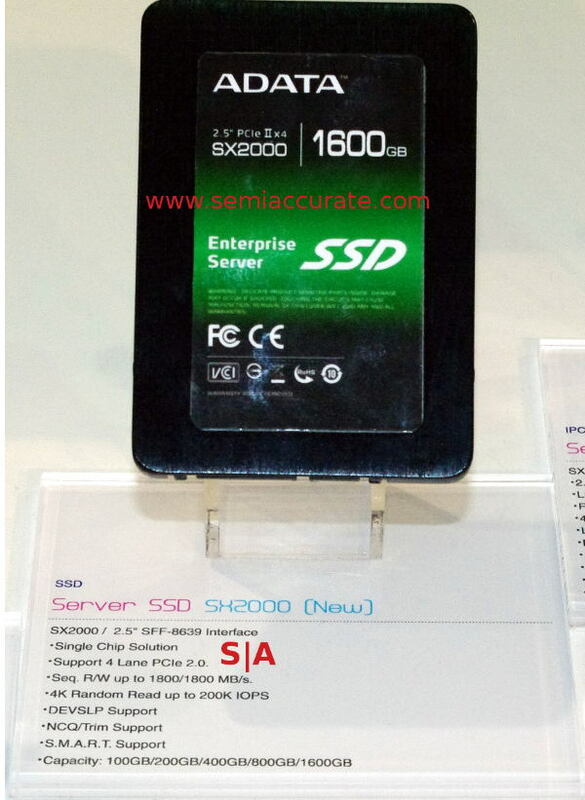 This drive is called XS1715 and comes in 400GB, 800GB, and 1.6TB capacities. It has a claimed 3000GBps transfer rate. The only problem we have with the release is that Samsung is claiming to have the worlds first 2.5″ NVMe SSD, something that is unquestionably not true.